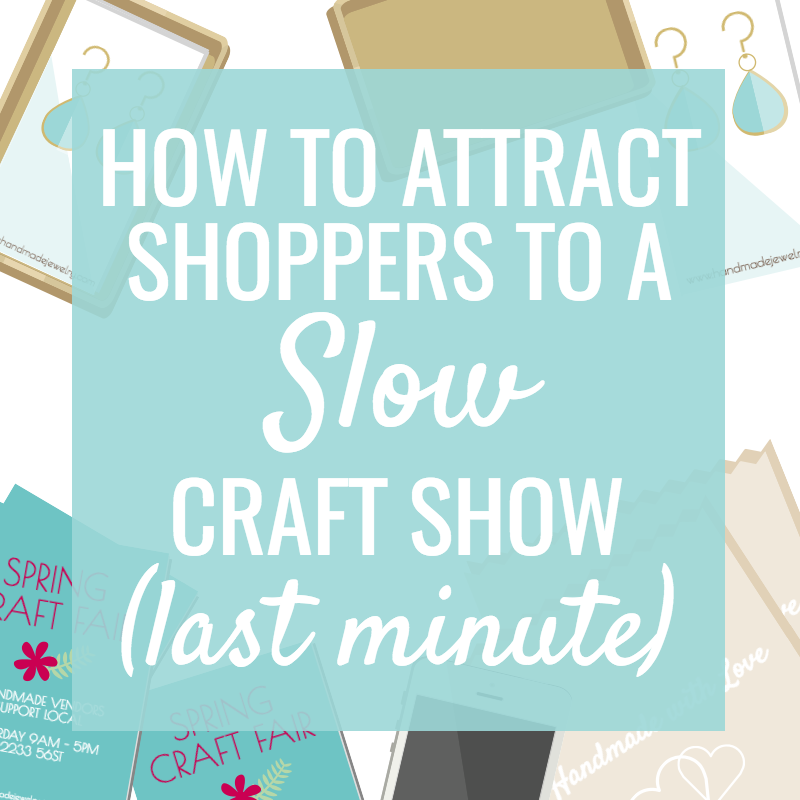 If you participate in enough craft shows, you’ll most likely come across a slow craft show that desperately needs to attract shoppers. 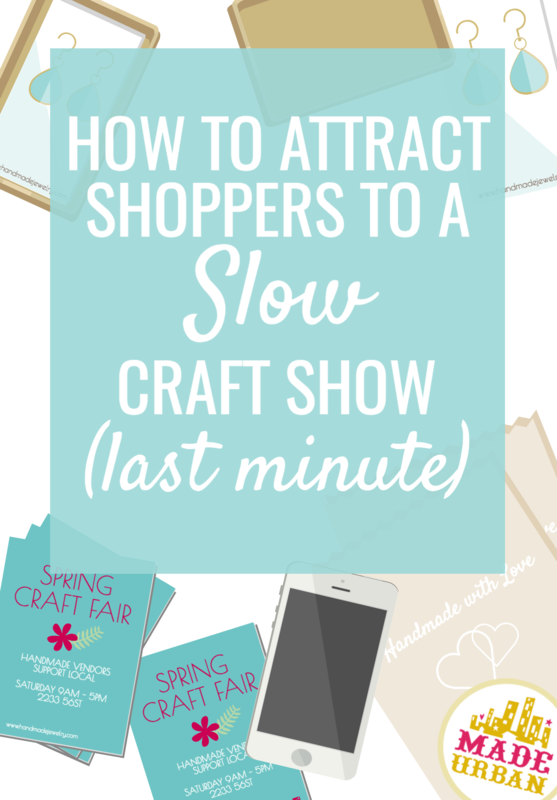 Although it’s not ideal, you can promote a craft show last minute and get people to the venue. Whether it’s poor marketing by the organizer or due to elements that are out of everyone’s control, like the weather, don’t throw in the towel just yet. It’s easy to feel upset and start complaining with other vendors but it’s better to keep a positive attitude and try your best to attract shoppers to save your sales. Here are 5 things to try. That’s the beauty of Facebook, Twitter, Instagram, etc. You can reach a large audience immediately and influence their plans. Take some pics or video of all the awesome items they’ll find at the event and be sure to use hashtags. Tag the city you’re in and any other keywords you think people may search when looking for something to do that day. Strength in numbers! Chat with the other vendors to try and get everyone on board and come up with a plan to promote the craft show. If everyone sends out a tweet and Facebook post letting their fans know not only that they’re at the show, but what other great vendors are there, you’ll all benefit. Email may not be quite as effective but could still be beneficial. Check out #3 below and if there are businesses that have a newsletter list, they could send out a quick newsletter blast with “Today only” in the title. Is there something you, the other vendors and organizer can put together to give away? Maybe everyone can donate an item to create a gift basket shoppers can enter to win. You can even make sharing part of the conditions for entry. Get each person who enters, to send out a tweet or Facebook post about the show. If you can’t group together for a prize, consider offering a discount on your items for that show and send out a tweet about it. The organizer could offer a discount on entry fees or even make a run to a local bakery and offer free cookies or hot chocolate to those who come through the door. If it’s a Christmas show, see if the organizer can get one of their helpers to go grab some wrapping paper, scissors and tape, set up a table and offer free gift-wrapping. Once the incentive is decided, be sure everyone does their part to share the news on social media. Take a look on Twitter to find some local influencers that could put out a tweet to help promote the event. Bonus points if there’s something newsworthy about the event. If it’s in support of a charity or the first event of it’s kind in your city, be sure to let them know that. It’s obviously too late for print (unless the show runs several days) and TV stations usually plan their segments several days in advance, but you could try calling into a radio station to see if someone can get on the air for a quick plug. The key to media is giving them a great story, not just advertising yourself, so be sure you think about what’s in it for them to cover you. Take advantage of the foot traffic by making signs letting people know what’s inside. Find some areas to tape them up (make sure you don’t violate any local laws) or even take turns or find a volunteer to walk around with a sign or hand out flyers. If there are local businesses around, head in to say hi and ask if they can hand out some flyers to send their customers your way. You’ll want to choose shops that won’t feel you’re their competition. 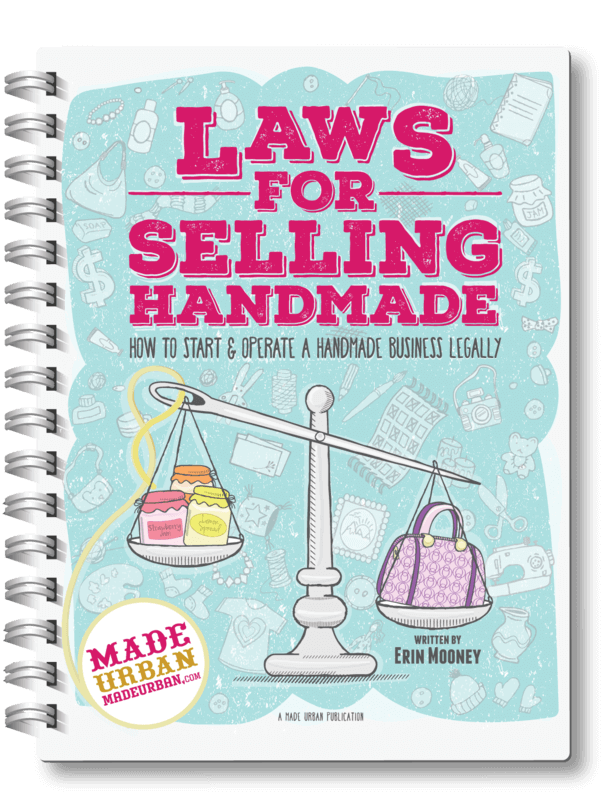 If you’re skeptical and wondering if this ebook is actually going to be valuable to you or thinking you can just find the same info around the web, please download the sample chapter MAKING PRODUCTS THAT PROFIT. It’s full of useful tips and just a small fraction of what’s in the full ebook. At the end of the day, it’s important to keep a positive attitude and make the most of each customer that stops by your table. If you don’t sell as much as you would have liked to, all you can do is chalk it up to a learning experience and look on the bright side; you have lots of stock for the next sale!